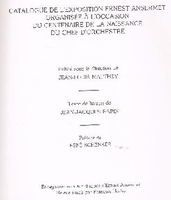 “In 1983, Jean Louis Matthey published ERNEST ANSERMET: 1883-1969 [traveling exhibition catalog organized on the occasion of the centenary of the birth of the conductor]. He works at the Swiss Historical Dictionary and Swiss musical revue. In addition, he was a member of the Swiss Group of International directory of music sources in Bern. For 50 years Ansermet directed an orchestra that was second-rate in tone and technique, yet Ernest Ansermet drew performances from it that cut right to the heart of the music. A musician of catholic taste, Ansermet was a reliable, insightful interpreter of composers from Mozart to Martin. His recordings in the 1950s and 1960s with the Suisse Romande Orchestra, which he founded, retain strong interest for collectors who value nuance over tonal sheen. 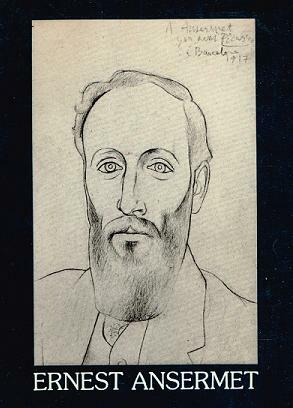 These recordings are of especial interest as they provide a link to composers active in Paris in the early twentieth century, with whom Ansermet was closely associated. 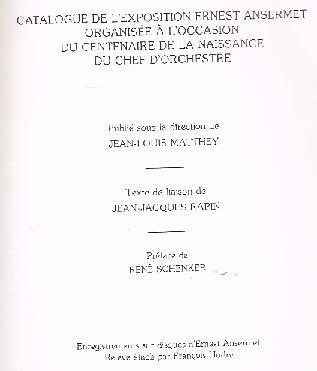 [In his youth] he kept an eye trained on the technique of local conductors, and took courses in music with Alexandre Denéréaz, Otto Barblan, and Ernest Bloch. Ansermet sought further advice on conducting from Felix Mottl in Munich and Artur Nikisch in Berlin, then concentrated mainly on teaching himself the art of the baton. In 1918 he organized the Orchestre de la Suisse Romande in Geneva, from the start performing a substantial amount of contemporary French and Russian music. Ansermet befriended many of the great progressive composers of the time, especially Claude Debussy, Maurice Ravel, and Igor Stravinsky. Through Stravinsky, Ansermet met Serge Diaghilev and was appointed principal conductor of the latter's Ballets Russes, touring with the company to Paris, London, Italy, Spain, South America, and the United States. During a 1916 tour Ansermet made his first recordings with the Ballets Russes orchestra -- the beginning of a half century of making intriguing records with less-than-stellar ensembles. Through his association with the Ballets Russes, Ansermet was able to premiere many of the period's most important dance scores, including Falla's THREE-CORNERED HAT, Prokofiev's THE BUFFOON, Satie's PARADE, and Stravinsky's PULCINELLA. As an extra-curricular wartime diversion, on 28 September, 1918, Ansermet premiered Stravinsky's L'HISTOIRE DU SOLDAT in Geneva.